The violin is a bowed string instrument with four strings tuned in perfect fifths which has become one of the most popular and most used instrument in the world for spontaneous music and formal compositions ranging from classical to folk and finally to popular/rock. It is the smallest and highest-pitched member of the violin family of string instruments, which also includes the viola and cello. Often when playing certain types of music on the violin, notably folk and country, the violin's normal bridge will be replaced with a bridge with less top curvature, enabling the player to play double stops and chords on the instrument more easily. When this type of bridge is used, the instrument can be referred to as a 'fiddle', a term originating from the instrument's use in folk music. A person who plays the violin is called a violinist or fiddler, and a person who makes or repairs them is called a luthier, or simply a violin maker. The words "violin" and "fiddle" come from the Middle Latin word vitula, meaning "stringed instrument," but "violin" came through the Romance languages, meaning small viola, and "fiddle" through Germanic languages. The violin emerged in northern Italy in the early sixteenth century. Most likely the first makers of violins borrowed from three types of current instruments: the 'rebec', in use since the tenth century (itself derived from the Arabic rebab), the Renaissance fiddle, and the lira da braccio. One of the earliest explicit descriptions of the instrument, including its tuning, was in the Epitome musical by Jambe de Fer, published in Lyon in 1556. By this time, the violin had already begun to spread throughout Europe. The oldest documented violin to have four strings, like the modern violin, was constructed in 1555 by Andrea Amati. Other violins, documented significantly earlier, only had three strings. The violin immediately became very popular, both among street musicians and the nobility, illustrated by the fact that the French king Charles IX ordered Amati to construct 24 violins for him in 1560. The oldest surviving violin, dated inside, is from this set, and is known as the "Charles IX," made in Cremona c. 1560. "The Messiah" or "Le Messie" (also known as the "Salabue") made by Antonio Stradivari in 1716 remains pristine, never having been used. It is now located in the Ashmolean Museum of Oxford University. Significant changes occurred in the construction of the violin in the eighteenth century, particularly in the length and angle of the neck, as well as a heavier bass bar. The majority of old instruments have undergone these modifications, and hence are in a significantly different state than when they left the hands of their makers, doubtless with differences in sound and response. But these instruments in their present condition set the standard for perfection in violin craftsmanship and sound, and violin makers all over the world try to come as close to this ideal as possible. Violin makers are called "luthiers"
The 'purfling' running around the edge of the spruce top provides some protection against cracks originating at the edge. It also allows the top to flex more independently of the rib structure. Painted-on 'faux' purfling on the top is a sign of an inferior instrument. The back and ribs are typically made of maple, most often with a matching striped figure, referred to as "flame," "fiddleback" or "tiger stripe" (technically called curly maple). These fractional sizes have nothing to do with the actual dimensions of an instrument; in other words, a 3/4-sized instrument is not three-quarters the length of a full size instrument. The body length (not including the neck) of a "full-size" or 4/4 violin is about 14 inches (35 cm), smaller in some 17th century models. A 3/4 violin is about 13 inches (33 cm), and a 1/2 size is approximately 12 inches (30 cm). 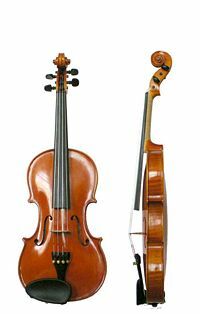 With the violin's closest family member, the viola, size is specified as body length in inches rather than fractional sizes. The form of the "full-size" viola averages 16 inches (40 cm). Occasionally, an adult with a small frame may use a so-called "7/8" size violin instead of a full-size instrument. Sometimes called a "Lady's Violin," these instruments are slightly shorter than a full size violin, but tend to be high-quality instruments capable of producing a sound that is comparable to fine full size violins. To tune a violin, the A string is first tuned to a pitch (usually 440 hertz), using either a tuning device or another instrument. (When accompanying a fixed-pitch instrument such as a piano or accordion, the violin tunes to it.) The other strings are then tuned against each other in intervals of perfect fifths by bowing them in pairs. A minutely higher tuning is sometimes employed for solo playing to give the instrument a brighter sound; conversely, Baroque music is sometimes played using lower tunings to make the violin's sound more gentle. 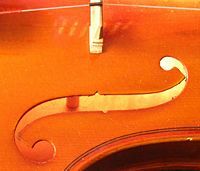 After tuning, the instrument's bridge may be examined to ensure that it is standing straight and centered between the inner nicks of the f holes; a crooked bridge may significantly affect the sound of an otherwise well-made violin. The tuning G-D-A-E is used for most violin music. Other tunings are occasionally employed; the G string, for example, can be tuned up to A. The use of nonstandard tunings in European classical music is known as scordatura; in some folk styles, it is called "cross-tuning." One famous example of scordatura in classical music is Saint-Saëns' Danse Macabre, where the solo violin's E string is tuned down to E flat to impart an eerie dissonance to the composition. While most violins have four strings, there are some instruments with five, six, or even seven strings. The extra strings on such violins typically are lower in pitch than the G-string; these strings are usually tuned to C, F, and B flat. If the instrument's playing length, or string length from nut to bridge, is equal to that of an ordinary full-scale violin (a little less than 13 inches, or 330 mm), then it may be properly termed a violin. Some such instruments are somewhat longer and should be regarded as violas. Violins with five strings or more are often used in jazz or folk music. The standard way of holding the violin is under the chin and supported by the left shoulder, often assisted by a shoulder rest. This practice varies in some cultures; for instance, Indian (Carnatic or Hindustani) violinists play seated on the floor and rest the scroll of the instrument on the side of their foot. The strings may be sounded by drawing the hair of the bow across them (arco) or by plucking them (pizzicato). The left hand regulates the sounding length of the string by stopping it against the fingerboard with the fingertips, producing different pitches. As the violin has no frets to stop the strings, the player must know exactly where to place the fingers on the strings to play with good intonation. Through practice and ear training, the violinist's left hand finds the notes intuitively by proprioception or muscle memory. Beginners sometimes rely on tape placed on the fingerboard for proper left hand finger placement, but usually abandon the tape quickly as they advance. Another commonly-used marking technique uses white-out on the fingerboard, which wear off in a few weeks of regular practice. The placement of the left hand on the fingerboard is characterized by "positions." First position, where most beginners start (although some methods start in third position), is the most commonly used position in string music. The lowest note available in this position in standard tuning is an open G; the highest note in first position is played with the fourth finger on the E-string, sounding a B, or reaching up a half step (also known as the "extended fourth finger") to the C two octaves above middle C.
Bowing or plucking an open string—that is, a string played without any finger stopping it—gives a different sound from a stopped string, since the string vibrates more freely at the nut than under a finger. Other than the low G (which can be played in no other way), open strings are generally avoided in some styles of European classical playing. This is because they have a somewhat harsher sound (especially open E) and it is not possible to directly use vibrato on an open string. However, this can be partially compensated by applying vibrato on a note that is an octave higher than the open string. Another method, called "hand vibrato," involves rocking the hand back at the wrist to achieve oscillation, while the third method, "arm vibrato," modulates the pitch by rocking at the elbow. A combination of these techniques allows a professional to produce a large repertoire of desirable tonal contours. The "when" and "what for" of violin vibrato are artistic matters of style and taste. In acoustical terms, the interest that vibrato adds to the sound has to do with the way that the overtone mix (or tone color, or timbre) and the directional pattern of sound projection change with changes in pitch. By "pointing" the sound at different parts of the room in a rhythmic way, vibrato adds a "shimmer" or "liveliness" to the sound of a well-made violin. There are a few books dedicated solely to the study of violin harmonics. Two comprehensive works are Henryk Heller's seven-volume Theory of Harmonics, published by Simrock in 1928, and Michelangelo Abbado's five-volume Tecnica dei suoni armonici published by Ricordi in 1934. Elaborate passages in artificial harmonics can be found in virtuoso violin literature, especially of the nineteenth and early twentieth centuries. Two notable examples of this are an entire section of Vittorio Monti's Csárdás and a passage towards the middle of the third movement of Peter Ilyich Tchaikovsky's Violin Concerto. The right arm, hand, and bow are responsible for tone quality, rhythm, dynamics, articulatio, and certain (but not all) changes in timbre. The sounding point where the bow intersects the string also influences timbre. Playing close to the bridge (sul ponticello) gives a more intense sound than usual, emphasizing the higher harmonics; and playing with the bow over the end of the fingerboard (sul tasto) makes for a delicate, ethereal sound, emphasizing the fundamental frequency. Dr. Shinichi Suzuki referred to the sounding point as the "Kreisler highway"; one may think of different sounding points as "lanes" in the highway. Playing the different articulations. There are many bowing techniques that allow for every range of playing style and many teachers, players, and orchestras spend a lot of time developing techniques and creating a unified technique within the group. A note marked pizz. (abbreviation for pizzicato) in the written music is to be played by plucking the string with a finger of the right hand rather than by bowing. (The index finger is most commonly used here.) Sometimes in virtuoso solo music where the bow hand is occupied (or for show-off effect), left-hand pizzicato will be indicated by a "+" (plus sign) below or above the note. In left-hand pizzicato, two fingers are put on the string; one (usually the index or middle finger) is put on the correct note, and the other (usually the ring finger or little finger) is put above the note. The higher finger then plucks the string while the lower one stays on, thus producing the correct pitch. By increasing the force of the pluck, one can increase the volume of the note that the string produces. A marking of col legno (Italian for "with the wood") in the written music calls for striking the string(s) with the stick of the bow, rather than by drawing the hair of the bow across the strings. This bowing technique is somewhat rarely used, and results in a muted percussive sound. The eerie quality of a violin section playing col legno is exploited in some symphonic pieces, notably the "Witches' Dance" of the last movement of Hector Berlioz' Symphonie Fantastique. Saint-Saens' symphonic poem "Danse Macabre" includes the string section using the col legno technique to imitate the sound of dancing skeletons. Some violinists, however, object to this style of playing as it can damage the finish and impair the value of a fine bow. 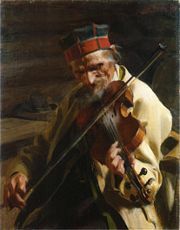 Attaching a small metal, rubber, or wooden device called a "mute" to the bridge of the violin gives a more mellow tone, with fewer audible overtones. Parts to be played muted are marked con sord., for the Italian sordino, mute. (The instruction to play normally, without the mute, is senza sord.) There are also much larger metal, rubber, or wooden mutes available. These are known as "practice mutes" or "hotel mutes." Such mutes are generally not used in performance, but are used to deaden the sound of the violin in practice areas such as hotel rooms. Some composers have used practice mutes for special effect, for example at the end of Luciano Berio's Sequenza VIII for solo violin, and in the third to fifth movements of Dmitri Shostakovich's String Quartet No. 8. Since the Baroque era the violin has been one of the most important of all instruments in European classical music, for several reasons. The tone of the violin stands out above other instruments, making it appropriate for playing a melody line. In the hands of a good player, the violin is extremely agile, and can execute rapid and difficult sequences of notes. While the violin has had very little usage in rock music compared to its brethren the guitar and bass guitar, it is increasingly being absorbed into mainstream pop with artists like Linda Brava, Miri Ben-Ari, The Corrs, Nigel Kennedy, Yellowcard, Dave Matthews Band with Boyd Tinsley, Arcade Fire, Jean-Luc Ponty, ELO, Camper Van Beethoven, Nickel Creek and The Who (in the coda of their 1971 song Baba O'Riley). The Jefferson Airplane, Jefferson Starship and Hot Tuna incorporated the electric rock violin stylings of Papa John Creach into their signature sound in the 1970s and 1980s. Independent artists such as Final Fantasy and Andrew Bird have also spurred increased interest in the instrument. It has also seen usage in the post-rock genre by bands like Sigur Rós, Broken Social Scene and A Silver Mt. Zion. The hugely popular Motown recordings of the 1960s and '70s relied heavily on strings as part of their trademark texture. Earlier genres of pop music, at least those separate from the rock and roll movement, tended to make use of fairly traditional orchestras, sometimes large ones; examples include the "Crooners" such as Bing Crosby. Up to the 1970s, most types of popular music used bowed strings, but the rise of electronically created music in the 1980s saw a decline in their use, as synthesized string sections took their place. Since the end of the twentieth century, real strings have began making a comeback in pop music. Some folk/viking metal bands use the violin in their songs (i.e., Thyrfing), and some even have a permanent violinist (i.e., Ásmegin). The violin is a very important part of South Indian classical music (Carnatic music). It is believed to have been introduced to the South Indian tradition by Baluswamy Dikshitar. Though primarily used as an accompaniment instrument, the violin has become popular as a solo instrument in the contemporary Indian music scene. The icon of Indian violin is Dr. L. Subramaniam, who has popularised Carnatic music all over the world. Other solo violinists include T. N. Krishnan, Kunnakudi Vaidyanathan, and Lalgudi Jayaraman. To be effective as an acoustic violin, electro-acoustic violins retain much of the resonating body of the violin, often looking very much like, sometimes even identical to, an acoustic violin or fiddle. They are often varnished with bright colors and made from alternative materials to wood. The first specially built electric violins date back to the late 1930s and were made by Victor Pfeil, Oskar Vierling, George Eisenberg, Benjamin Miessner, George Beauchamp, Hugo Benioff and Fredray Kislingbury. The majority of the first electric violinists were musicians playing jazz and popular music. ↑ viola, Online Etymology Dictionary. Retrieved July 8, 2008. ↑ Rebecca Arkenberg, (Renaissance Violins. Timeline of Art History. New York: The Metropolitan Museum of Art. Retrieved November 29, 2013. ↑ Robin Kay Deverich, Historical Background of the Violin. Retrieved November 29, 2013. ↑ William Bartruff, The History of the Violin. Retrieved November 29, 2013. ↑ Violin by Antonio Stradivari, 1716 (Messiah; la Messie, Salabue). Cozio.com. Retrieved July 8, 2008. ↑ Richard Perras, "Violin changes by 1800." Retrieved November 29, 2013. ↑ Martin Schleske, "Acoustics research - Sound analysis: Method". Retrieved July 8, 2008. ↑ Craig Timmerman, Journey Down the Kreisler Highway: Reflections on the Teachings of Shinichi Suzuki (Ivory Palaces Music Pub., 1987, ISBN 0943644070). Bardfeld, Sam. Latin Violin: How to play Salsa, Charanga and Latin Jazz Violin. GERARD and SARZIN PUBLISHING CO., 2002. ISBN 0962846775 and online.changingtones.com. Retrieved July 8, 2008. All links retrieved November 29, 2013. "The history of the violin" A quick overview about the history of the violin, including answers to questions such as 'Why old master instruments sound so good'. "Violin Acoustics" University of New South Wales. anechoic recordings of violin sounds, both arco and pizzicato at various dynamics "Musical Instrument Samples," University of Iowa Electronic Music Studios. Violinist.com "Large online community for violin professionals, students and fans," includes discussion board, directories and blogs. Early History of the Violin (1520-1650) BestStudentViolins.com. Archive of violin and bow makers amati.com. This page was last modified on 29 November 2013, at 20:31.